Our Thermobead Injected wall cavity system is offered as the best solution for block construction, whether in new build or upgrade. We offer a complete energy service to our customers, whether you are a homeowner or a contractor. Pumped into drilled 22mm holes in the wall – as it is applied under pressure it fills every void producing a complete fill everytime with no cold spots. If your home was built from 1920 onwards, it’s likely to have cavity walls. The cavity should be at least 50mm wide and the walls need to be in reasonable condition. Are your external walls easy to access? Cavity wall insulation is normally blown into the cavity from the outside of a house (may differ in a new build). Every part of the wall must be filled with insulation, so it’s important that we can reach all your external walls. If your home’s external walls are joined to another house, a cavity barrier will need to be inserted to contain the insulation, so your neighbours aren’t affected. How is the installation installed? To insulate your cavity walls, we drill small holes around 22mm in size at intervals of around 1m in the outside wall of your home. 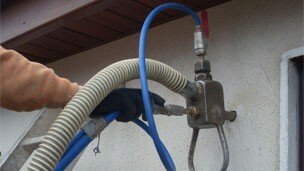 We then blow the bonded bead insulation into the cavity with specially designed equipment, . Once all the insulation is in, the installer fills the holes in the wall so you’ll barely notice them. Filling cavity walls is not a job you can do yourself: you will need to find an experienced installer. The job can usually be done in around two hours for an average house with easily accessible walls; it should be simple, quick – and make no mess. Help reduce your homes energy bills. Does not shrink, settle or crack. Reduce your homes carbon footprint. Will increase your homes value. For further technical detail on the Thermobead used by John O’Leary Home Improvement Services – click on the link below. As with all of our products our all inclusive service starts with a free in home consultation and quotation arranged at your convenience. Call us now on: 027-66115, 021-4966612.